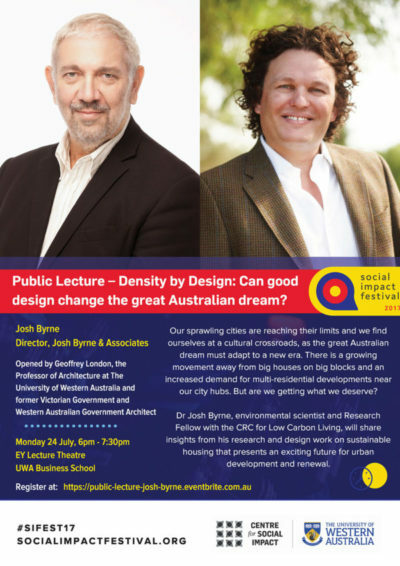 Dr Josh Byrne will be using his upcoming Public Lecture at the University of Western Australia’s (UWA) Social Impact Festival to invigorate important national and state conversations about how cities such as Perth can better achieve denser, more affordable living without compromising on social wellbeing or aesthetic design. Titled ‘Density By Design – Can Good Design Change the Great Australian Dream?’ Josh will share his research work on the innovative Density By Design and WGV at White Gum Valley projects to demonstrate how a brighter, more sustainable future lies in the enabling of innovative housing design projects. Josh’s presentation is part of the Social Impact festival, a 10-day festival for cutting-edge knowledge and ideas and it celebrates initiatives that are creating positive social change in Australia and abroad. Josh will be introduced by Geoffrey London, the Professor of Architecture at UWA and former Victorian Government and Western Australian Government Architect. Geoffrey and Josh are currently working together with LandCorp on the Baugruppen project at WGV, an initiative that looks to establish a replicable, higher density, more sustainable and more affordable approach to residential developments. Tickets to Dr Josh Byrne’s Public Lecture can be booked at Eventbrite or via the Social Impact Festival website.